Older People Sleep Less. Now We Know Why. Often as people age their sleep patterns change and they spend much less time asleep. We may know this from observation but the physiological reasons why have been elusive. A great deal of research goes into discovering the nuances of sleep as it is a fascinating phenomenon we are just beginning to understand. We begin as infants, sleeping almost seventy percent of our days. During this time we grow at an incredibly rapid rate. As we mature, we need less sleep; by the time we turn twenty, we’re sleeping (hopefully) the basic seven to nine hours a night. We understand on a rational level why younger people need more sleep; the question has become why do older people sleep less? Not only do older people sleep less, but quality of sleep deteriorates as we age. A recent study published in the journal Brain compared a group of neurons called the ventrolateral preoptic nucleus of the hypothalamus in forty-five elderly people (average age at the time of death was 89.2 years). Twelve of these had Alzheimer’s disease. All of the subjects had reported on their sleep activities on a regular basis since 1997. The findings of the chemistry in their brains correlated with their self-reporting: those who slept less and–more importantly–experienced fragmented sleep had less galanin in their brains, whether or not they had Alzheimer’s disease. Those with Alzheimer’s had even fewer galanin receptors. Fragmented sleep is more prevalent in people with Alzheimer’s disease. The research becomes important not only in the general context of discovering how sleep works but in finding ways to improve sleep in older people. It may seem “natural” for older people to sleep less but many experience insomnia and interrupted, poor-quality sleep. Many wake up not feeling rested and refreshed but simply unable to sleep more. So it’s not because they necessarily need less, they just can’t sleep more. The number of people with Alzheimer’s disease is estimated at five million people; one in three seniors dies with some form of dementia. By 2050, that number may triple. Deaths from Alzheimer’s disease has increased by sixty-eight percent since 2000. Alzheimer’s is currently incurable but there are things you can do to prevent it from developing–sleeping well is a big part of that. Dementia in seniors has far-reaching effects. The rising number of dementia cases affects not only the people living with it but their caregivers, institutions, and the infrastructure that supports them. With better sleep, there may be a decreased risk for neurological degeneration which would have a ripple effect to generally improve seniors’ quality of life as they age. With research like the one covered here, science hopes to develop drugs to help with that. The impact of sleep can’t be over-emphasized. Good quality sleep is crucial for normal, healthy brain function. While we sleep, one of the many things that happens in the body is the brain is flushed with cerebrospinal fluid that takes away with it toxins that have accumulated during the day, sort of like your daily shower. Some of those toxins have been related to the development of neurological disorders, including Alzheimer’s; if you don’t shower, residual crud makes you stink. Getting older doesn’t have to be horrible. There are actually very positive aspects to it. Keeping in good health is key. 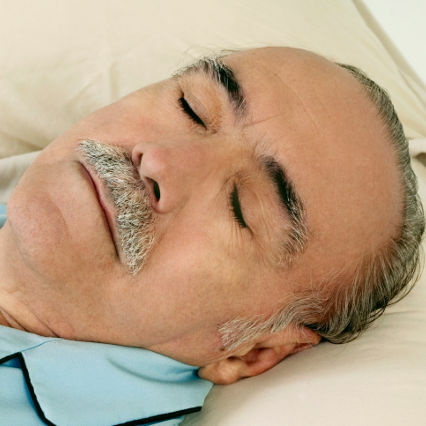 Latest Headlines » Sleeping Disorders » Older People Sleep Less. Now We Know Why.